The new generation of the pickup offers upgraded infotainment and beefy construction. The first version of the new generation of Nissan’s full-size Titan pickup arrived for 2016, much bigger and bolder than its predecessor – and sporting a whopper of a Cummins diesel engine, a first for the Titan. 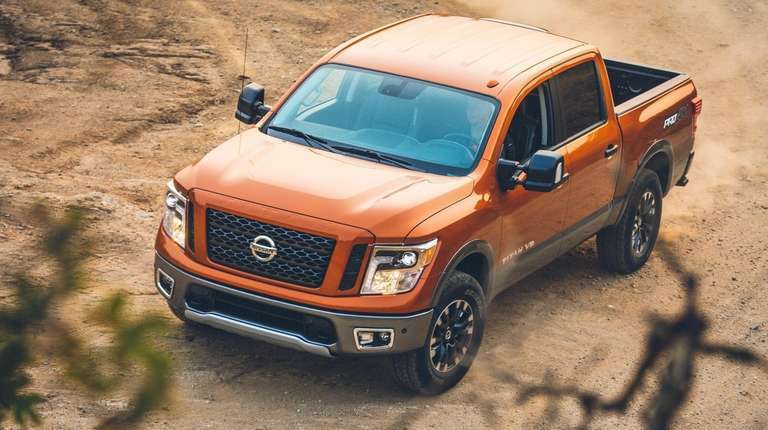 A few months later, a smaller, lighter version of the new Titan arrived, with a choice of V-6 or V-8 gasoline engines, using a different chassis that’s 14.7 inches shorter than that of the XD. Both the XD and the smaller Titan half-ton (1500) models come in three configurations: Single Cab, King Cab and Crew Cab. Now for 2019, the beefy XD – the only heavy-duty pickup offered by a non-Detroit automaker — has a starting price of $32,890 (plus $1,395 freight) for the base Single Cab model with rear-wheel drive and a 5.6-liter gasoline V-8 engine, or $38,520 for the same model with the 5.0-liter Cummins diesel. It has shift-on-the-fly four-wheel drive with low-range gearing, Hill Start and Hill Descent assist, an electronic locking rear differential, and 18-inch alloy wheels with dark paint finish. A full-size spare tire is included – a must for trail driving. The Titan XD should please consumers who crave beefy pickups, and the 5.0-liter Cummins engine will satisfy most everyone’s power needs. Of course, keep in mind that this is still not an F-series Super Duty, Ram HD or Silverado HD, so it doesn’t have quite the trailer-towing capabilities some of those three-quarter-ton trucks can offer with their diesels. The interior is designed to feel more like that of a luxury sedan, with very comfortable bucket seats up front, and a quite roomy rear bench seat that genuinely gave three adults plenty of leg, knee and headroom. The roof is so high that you can even wear a cowboy hat while you’re driving the Titan XD, so that’s certainly a plus in Texas. Our tester came with the Pro-4X Convenience Package ($3,545), which added leather seats with contrast stitching and Pro-4X embroidery; a four-way power-adjustable front passenger seat (to go with the standard eight-way power driver’s seat); heated front and rear seats; power/heated tilt/telescopic leather steering wheel with contrast stitching; memory for the driver’s seat, outside mirrors and steering-wheel position; a compass on the navigation display; remote engine start; auto-dimming outside mirrors with (annoying) automatic reverse tilt-down; advanced NissanConnect services; and auto-dimming rearview mirror with universal garage/gate opener. EPA fuel economy: Not available – vehicle is exempt.